Teddy Kollek was the legendary Mayor of Jerusalem from 1965 to 1993. After the reunification of Jerusalem in 1967, he dedicated himself to rebuilding the city and was often called “the greatest builder of Jerusalem since Herod.” The Israel Museum, Jerusalem Theater and Biblical Zoo were all established during his tenure. In 1966, he founded the Jerusalem Foundation, which has contributed hundreds of millions of dollars to the city’s budget to establish recreational and cultural sites, restore ancient sites and fund community programs and cultural events. 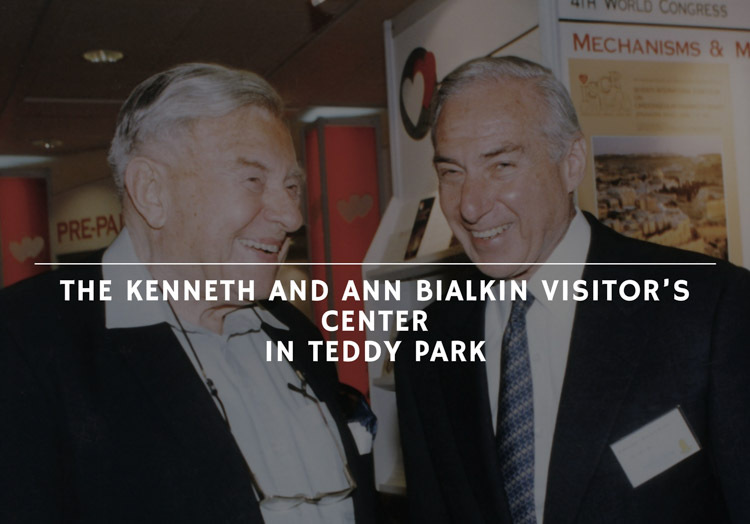 The Kenneth and Ann Bialkin Visitor’s Center in Teddy Park tells the story of Teddy’s life and accomplishments via eight stations and a 3D film installation.